As a Frugal Living blogger, one of my favorite times is browsing your Frugal Fashionista links and cheering you on for embracing the world of second hand fashion. I know, for many of you, it took a lot to “come out of the closet,” but I love encouraging others to realize that you don’t have to be a “millionaire” to dress like one. In fact, a few dollars, some great yard salse, and fabulous accessories equals the formula for one amazing wardrobe. This week’s featured outfits were actually taken awhile ago, but I felt the outfits didn’t meet the “cut.” Convicted, I realized that if this series is going to be whole heartedly beneficial, it can’t just highlight outfits that say “wow” every time because that isn’t how I dress on a day to day basis. The outfits below are casual, but they show how one core wardrobe shirt can be used to create various looks. Typically, I pair this $1 Banana Republic shirt with jeans in the winter, and jean shorts in the summer. The versatile 3/4 sleeves allow it to be worn year round. Stepping out of my comfort zone a bit (which I highly encourage), I wore a plaid skirt that made me feel a little preppyish, yet it dressed it up for a very casual, but comfortable look. I could have chosen flip flops for the summer or boots would be a fun option for cooler weather. Just by changing jewelry and highlighting $0.50 yard sale long, blue earrings give the look an instant elegance. Pull the shirt off the shoulders a bit, tie longer hair up in a knot, add dramatic earrings, a long flowing skirt, and you now have changed your day look to an elegant “night on the town” look that only took a minute or so to make a difference. It’s often hard to transition from season to season because there are a few weeks where the weather varies. By adding a jacket, you can gap those hard to plan for weeks. I love to “gap” those days with my $5 Gap jacket. It goes with nearly everything. Remember, whether you purchase new or second hand, buy clothing out of season. You’ll be thrilled you did in a few months. This is your day to share your Frugal Fashionista finds. Remember, I love awesome deals from the store, but at least part of your main wardrobe pieces need to be second hand in order to link up. Link directly to your FF post and not your home page URL. This will let everyone find your post months from now. Please link back to my blog in your post so that every one can join in on the frugal fun. Unfortunately, I will delete any links that do not follow these few simple requests. 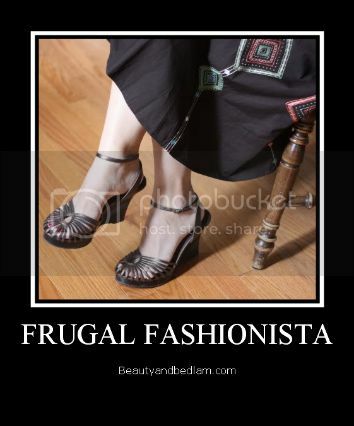 Thanks Jen for sharing those Frugal Fashionista Finds! Great mix & match ideas! Great outfits Jen! I love the plaid skirt! I linked up my frugal office fashions. Thanks for hosting! Love your outfits! Linking up today with a few of my own favs this summer! Jen, I loved the fashion show as always. I would have loved to participate, but I’ve been battling morning sickness (and we all know nausea and thrift stores don’t mix). Hopefully next time I can link up some maternity finds! Thanks for hosting! Jen, I had to tell you about my amazing finds the other day at our on post thrift store. I am much more limited here (my hubby is stationed in Germany) due to the differences in sizes and the fact that yard sales don’t happen. I have been ready for some deals and I FOUND THEM! I got a pair of denim jeans for fall $3, Gap Khakis (boot cut) $3, navy pea coat (canvas) for 50 CENTS and a pair of Banana Republic capris for 50 CENTS! I was so excited that while I can’t wear many of the pieces now since it is 95 degrees and NO central a/c, I will be looking great in the fall and winter! Thanks for your posts! I am excited about what I CAN do here! I’m going garage saling this weekend with my mom. After checking out all the amazing find these gals snagged I can hardly wait! Thanks for the inspiration Jen! Oh dear – it’s probably been too long to link up – I got a dress for FREE at my fav thrift store b/c the zipper was defective (dress was brand new w/tags) so I got a 25 cent zipper and replaced it then bought two belts that will work with the dress b/c whoever bought it originally must have kept the belt when they ditched the dress. Anyway, I finally finished it, but several days too late so I’ll hang on to it for next time! I so enjoyed seeing your deals and everybody else’s – you really inspire us to step outside of comfort zones!